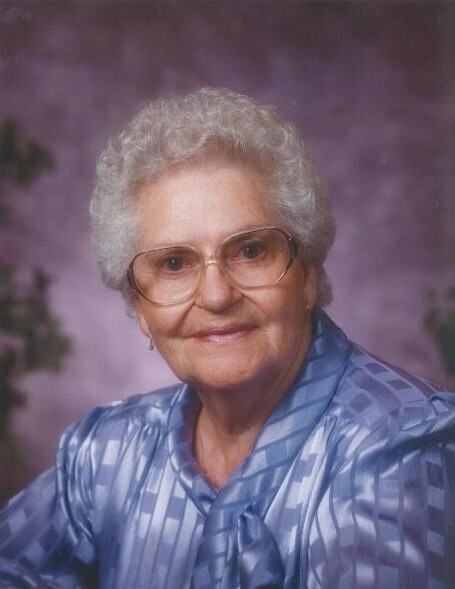 Obituary for Antonia Helman | Binkley's Funeral Service Ltd.
HELMAN, Antonia (Tonie) Marie was born on January 18, 1925 on her uncles farm south of Prelate, Sk. She passed away at the Meadows in Swift Current, Sk. on March 25, 2019 at the age of 94 yrs. Tonie was raised on a farm 2 miles east of Lancer, Sk. and grew up with her parents, 6 sisters and 4 brothers. She attended school at Lancer. On April 23, 1946, Tonie married Gregor Wendell Helman. They lived on the Helman farm 8 mi. SW of Lemsford, Sk. Tonie & Greg raised 9 children, 3 daughters and 6 sons. Tonie was predeceased by her husband Greg in 1977, her sons Gene and Cameron, grandsons Gregory and Cole, son-in-laws Gary and Bernie, her parents and siblings. Tonie loved music and singing. She was a beautiful alto singer. When she was young, Tonie went to every dance she could, and later on, she & Greg enjoyed going to dances with their many friends. A sweet memory of Tonie’s children; the kids would all pile onto Tonie & Greg’s bed on Sunday mornings, Greg would play the guitar & he & Tonie would sing. Tonie was a wonderful cook and baker; her homemade bread, her chokecherry jelly, her preserves and her knack for cooking “the best wild meat in the west” is still a favorite memory among family and friends. Many would stop in at the farm to enjoy meals with the family, including traveling salesmen who just seemed to always arrive right at meal time! The Helman family farm was always “Grand Central Station” for family and friends who came often to enjoy food, card games, good company and lots of laughs and fun. Tonie was a “Master of Crochet”. She crocheted many blankets and bed covers for her children and grandchildren, including the pets. Tonie’s favorite charity work was crocheting and donating over 200 blankets to the Children’s Ward at the Royal University Hospital in Saskatoon. She wanted the children to have their own blanket to comfort them and to have their special blanket to take home. Tonie was an avid reader. Some of her grandchildren called her “the encyclopedia”. No matter what the question was, she always had the answer. A sense of humor and her wonderful impersonations gave her children many laughs. Colton & Natalia (Mitch), Eve & Jacob, Sophie, June & Lenni There are those who leave footprints on our hearts. Tonie left footprints on the hearts of her family and friends.